The Pareto Rule has yielded the floor to The Long Tail of Big Data.Big data has emerged as the latest and greatest of tools for marketers seeking to leverage information to sell products. But as the amount of data captured has expanded, we've created "long tails" of information. This article explains how, in order to monetize all points of the long tail, low-cost, non-traditional marketing techniques must be utilized to reach a wider but smaller audience at all points of the tail. The Pareto Rule has yielded the floor to The Long Tail of Big Data. 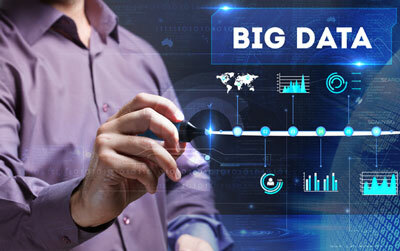 Big data has emerged as the latest and greatest of tools for marketers seeking to leverage information to sell products. But as the amount of data captured has expanded, we’ve created “long tails” of information. 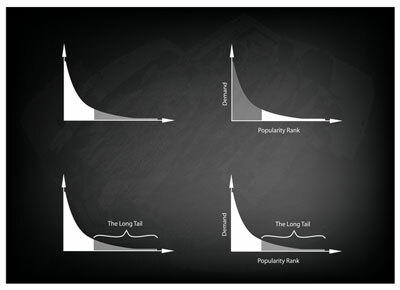 This article explains how, in order to monetize all points of the long tail, low-cost, non-traditional marketing techniques must be utilized to reach a wider but smaller audience at all points of the tail. Big data is mixing its metaphors. We’ve heard about data lakes, those repositories of information where it’s a sink or swim situation, and most managers are simply drowning in the variety, velocity and volume of data sets. This data is collected from a variety of points across a distribution curve. According to Dell EMC, the long tail of data happens when the majority of information you collect is from customers spread across the organization. Instead of 20% of the customers providing 80% of the actionable data, as in the Pareto Rule, long tail data has many variables collected from a magnitude of sources. In an era of big data, this is the rule and not the exception. In marketing, the practical application of the Pareto Rule has been to define specific segments based on larger more generic samples, such as female aged 35 to 45 with a household income of $80,000 annually. But our ability to capture and analyze data across seemingly disparate points in the customer marketing continuum has allowed the ability to target market segments in more minute detail. Today, big data has allowed us to potentially monetize the data we’re collecting in new ways, changing how we market products and services to a much wider audience. -Lower the costs of marketing to a wider audience through e-commerce-centric apps and self-service portals. -Personalize offers specific to the individual customer targeting specific preferences and behaviors. -Increase the use of low-cost marketing techniques such as email, texts, and social media, while lessening traditional high-cost, broad efforts such as television advertising. -Leverage social media to uncover network relationships and improve customer engagement. -Use geo location to improve marketing expediency and relevance. Of course, the industry standard for all of these applications can be seen any time you update your status on Facebook. Data managers, are you paying attention? Aggregating and mining data across the long tail will yield actionable insight. It’s clear the biggest challenge to knowledge management in enterprise organizations is integrating the variety of data sources available. We now have access to so much information across the long tail, from “dark” data, legacy transactions, unstructured data, behavioral sets – and so much more. There are literally hundreds of thousands of silo data points across most large enterprise organizations. Capturing and integrating this data will require automation and machine learning in order to grapple with the overwhelming influx of data sets across the long tail. While best practices are still emerging, it is clear that aggregating and mining these diverse resources hold the key to wresting control of the big data long tail.